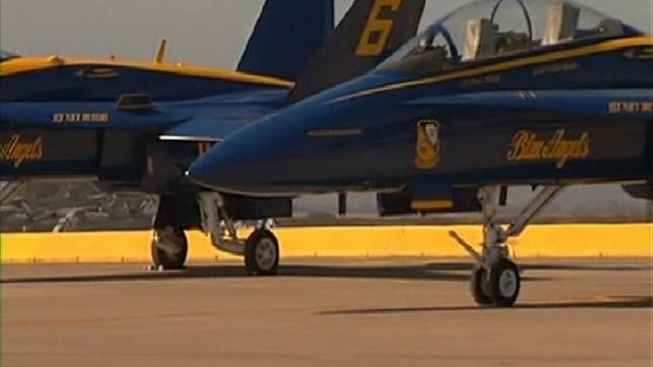 The Blue Angels will be flying over the San Francisco Bay this weekend. Are your windows rattling? Is your dog hiding under the bed? Are you finding it hard to make yourself heard over the roaring sounds coming from the sky? It's Fleet Week in San Francisco and the famous Blue Angels, the Navy's precision flight demonstration team, are taking practice laps over the city in preparation for this weekend's air shows. The flight team and other participating plans will be conducting an air show practice run this afternoon from roughly 1 to 3. The practice will be shorter than the full air show, but just as loud, said Fleet Week spokesman David Perry. "There's no way around it, the planes flown by our men and women in the Navy are very loud," Perry said. "That's why we want to make sure people are warned, we know some people are very sensitive to that." Saturday's show will begin with the Parade of Ships at 11 a.m. Ships will arrive through the Golden Gate and berth along the city's waterfront for the remainder of their visit, which concludes Tuesday. Air shows will take place Saturday and Sunday from 12:30 p.m. to 4 p.m. The shows will be visible all along the city's waterfront, but tickets can be purchased for seats on the Marina Green. Perry said that those concerned about recent air show disasters should be reassured that the level of safety is high for this weekend's events, and noted that there is a difference between the kind of air show put on by the Blue Angels and the air races that led to 11 deaths in Nevada last month. "First, in an air show the planes are farther removed from the spectators," Perry said. "Second, these are professional navy pilots, they are the best pilots flying the best planes under the best circumstances imaginable. The safety and security practices are the best in the world." Fleet Week brings together the U.S. Navy, Marine Corp and Coast Guard to offer air shows, ship tours, a parade and festivals, according to event organizers. Approximately 10,000 military servicemembers and nearly a million air-show spectators are expected to flock to San Francisco for this year's events, which mark the 30th anniversary of Fleet Week's current form. According to the San Francisco Fleet Week Association, the nonprofit organization coordinating the festivities, this year's Fleet Week will also focus on disaster response preparations. Details about other events -- including performances by military bands and ship tours -- can be found at www.fleetweek.us.